I posted some bright wedding inspiration colors last week and I am still thinking of going in that direction. I promise all my posts wont be wedding related, it's just what is top of my mind lately. I LIKE the wedding posts! I have to admit that I have thought about how my blog might have some wedding content at some point in the future. :) It's exciting to come along for the ride, especially since most of my friends are already married and those that have gotten married in recent years haven't needed a ton of help from bridesmaids and friends, so I haven't gotten to tag along for any planning. It's just so exciting! LOVE that first one, especially. Style Me Pretty is great. 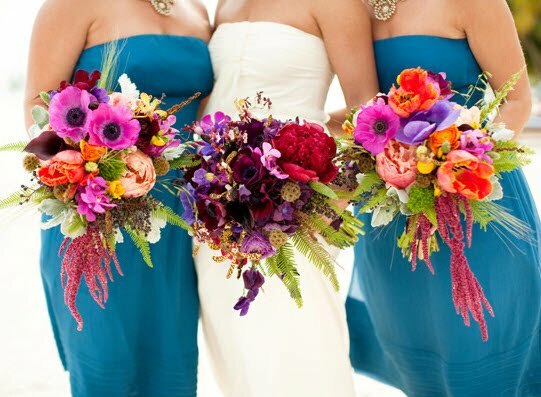 I love all of these colorful bouquets! You're allowed to be excited! I love all the color. As it should be!!! Enjoy this process! You'll probably remember it more than the actual day! Sad to say but your nerves and excitment will be in over drive! If it weren't for photos and videos I would have only remember a few minutes of the actual ceremony! This is sad and funny all at the same time- Mr. Treasures was sooo nervous he basically married the priest. He'd look at me for a few seconds and then stare at the priest and repeat every word. I'm actually bobbing my head and giggling in the video trying to get him to make eye contact with me!! 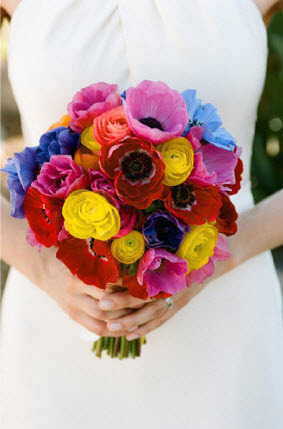 I adore vibrant colors for wedding bouquets. I did that with my fall wedding in 1999. Gorgeous colors. I received so many compliments. Have you played with the inspiration board builder yet? It's SOOOO FUN! That first one is fabulous! Gorgeous flowers. The colors are beautiful. Congratulations!! I LOVE wedding talk! 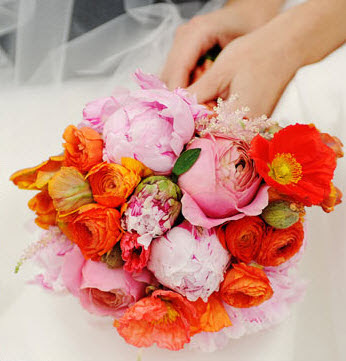 Those flowers are sooooo amazing, I would love to plan another wedding so I could pick bright beauties and, of course, a new dress! Have fun and enjoy every minute! Do you follow Peacock Feathers Blog? She loves her color and has been planning her wedding as well. I think she's got some great inspiration pic's!!! those are beautiful and bright colors photograph SO well! no worries about the wedding posts, write about whatever you're thinking about and inspired by! For some reason, I'm definitely feeling the color palette in the first image for you. Could it be the peacock reference? Congratulations! LOVE the beautiful colors. I love living vicariously through you, seeing as that I am already married.... think in 25 years, will you look back and say, I love it. I love my wedding day today as much as yesterday. Pretty colors are always in fashion, heck maybe one color is your signature??? I think the season will have a lot to do with the color you pick, or I should say the flowers you pick. 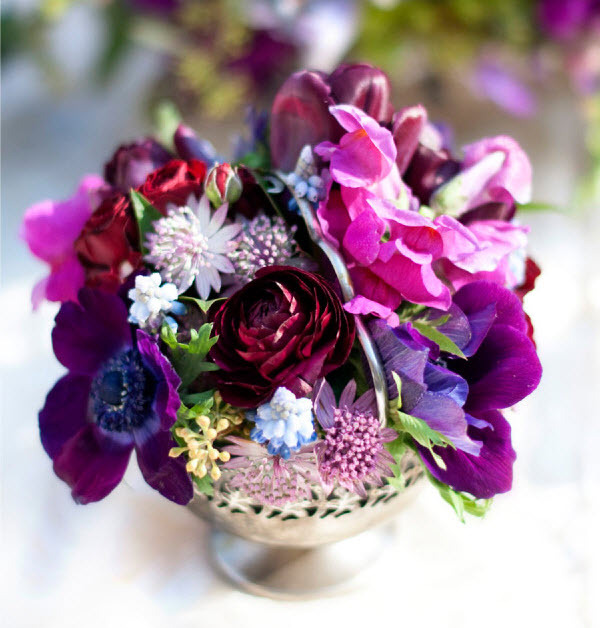 oh my i LOVE the mixing of flowers!! never thought i would..but do i ever!!!! love cabbage roses! so pretty. I'm excited to read all of your wedding stuff. I want bryan to marry me again. Thanks For stopping at my blog your Blog is great! So pretty. I love all of those bold colors. I'm totally jealous of you. What fun to be planning a wedding! I wish I could do mine all over again. I don't think Mom and Dad would appreciate it, but I would LOVE it. I have to say I love bold weddings in pictures. We had a softly hued wedding and every now and again I wish it was a bit brighter in the pics. Love the flowers especially! I love all your inspiration. Keep posting away! These flowers are absolutely gorgeous. GAH! 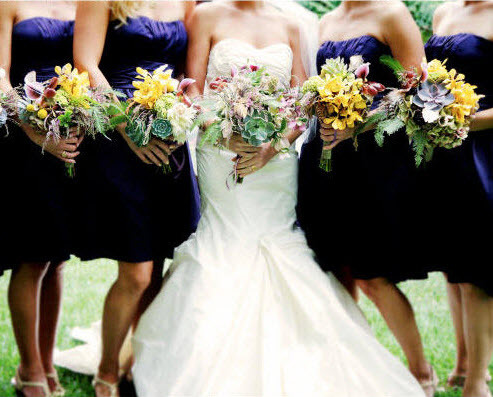 Those bouquets are STUNNING! The last is def. my favorite! 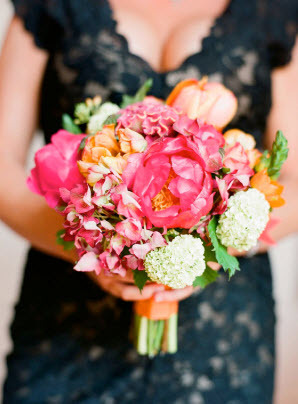 Those bouquets are gorgeous, but I am CRAZY for the pink and orange! Love it so much, and wish I had done it for my wedding! I can't question why you fell in love with those flowers. It is absolutely gorgeous.